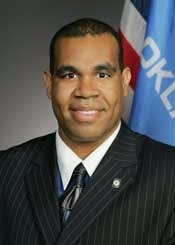 The Oklahoma Federation for Children, a state affiliate of the American Federation for Children, announced in a news release today that former state Sen. Jabar Shumate (D-Tulsa) is joining the staff as Director of Legislative Affairs and State Director for Oklahoma. Shumate resigned from the Oklahoma Senate at the beginning of the year to take on promoting school choice policies in the state full-time. Since 2012, Shumate served as a Democratic Senator for Oklahoma’s 11th Senate District. He has been an advocate and champion for educational choice throughout his term, and has authored and introduced numerous education bills to the Oklahoma State Senate. Shumate’s legislative experience and keen political insight will be tremendous asset in Oklahoma and throughout the country. Featured at several national conferences, Shumate is a sought-after speaker in the ed reform community who has addressed legislative leaders throughout the country about the need to break down barriers to educational choice. The Oklahoma Federation for Children is chaired by Bob Sullivan of Tulsa and Russell Perry of Oklahoma City. The Oklahoma Federation for Children works to increase the array and quality of K-12 educational options available to Oklahoma’s children. The Oklahoma Federation for Children is a state-based project of the American Federation for Children, the nation’s voice for educational choice.